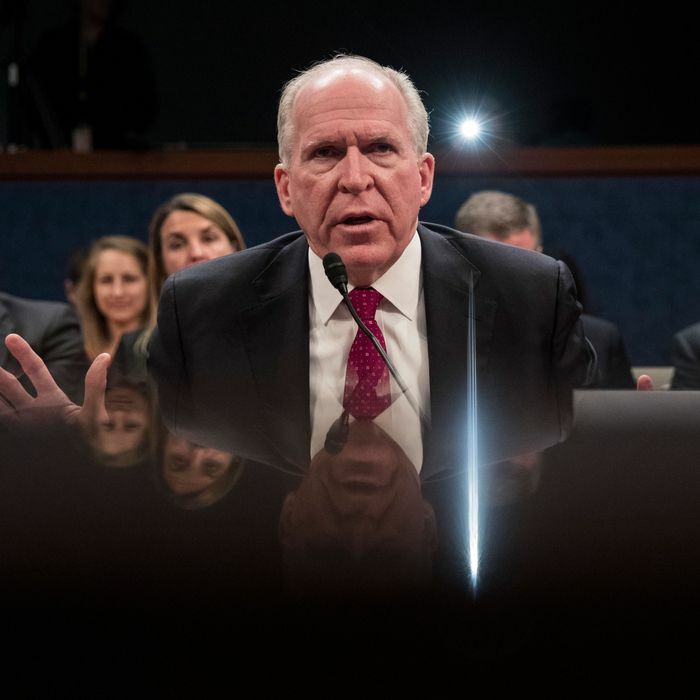 Last week, a vengeful President Trump revoked John Brennan’s security clearance, for reasons that he didn’t bother to disguise as anything other than grievance over the former CIA director’s views regarding the Russia investigation. On Sunday, two of Trump’s advisers went on television to justify the president’s actions by attacking Brennan in terms that were alternately hypocritical and hateful. First up was mustachioed super-hawk John Bolton, the president’s national security adviser, who pulled the classic Trump maneuver of fully projecting one’s own weaknesses onto an adversary. The dubious veracity of his claim aside, one could scarcely imagine a less appropriate messenger for this line of attack. During his long career as a diplomacy-averse diplomat, Bolton has developed a reputation for prioritizing his inveterate suspicion of foreign powers over pesky facts. A thorough investigation by ProPublica found that Bolton had a nasty habit of “exaggerating, minimizing or cherry-picking intelligence information to bolster his policy positions, and of retaliating to try to silence intelligence professionals with whom he disagreed.” Over the years, he has swatted away evidence to play up supposed nuclear threats from Cuba and Syria. He was an enthusiastic cheerleader for the Iraq War, and still thought the decision to invade was a good one as of 2015. In his current role, his well-established enmity toward Iran informed his false claim that the country violated the nuclear deal it signed with the United States. (Bolton would have preferred bombing the country in the first place.) Politicizing intelligence is practically the man’s life’s work. Undisguised Islamophobia is a prominent feature of mainstream conservatism (Bolton is one of its most enthusiastic adherents), and the Rudy Giuliani who defended Islam after September 11 has long since been replaced by the one who helped make President Trump’s Muslim ban more palatable. Still, the notion that Brennan’s character is fatally flawed because he deigned to offer a single piece of praise for a religion that almost 2 billion people practice is a stunning assertion, even here and now. As is not uncommon in this White House, Giuliani’s reasoning seems suspiciously close to a longtime conspiracy theory, this one holding that Brennan secretly converted to Islam while he was stationed in Saudi Arabia in the early 1990s. Their arguments may be especially unsound, but Giuliani and Bolton aren’t the only powerful Republicans to side with the president over Brennan. On Friday, Senator John Kennedy called Brennan a “butthead” (yes), and said he saw no reason why he should maintain a security clearance. Several other Republican Senators endorsed Trump’s banana-republic tactics, too. Though Democratic Senator Mark Warner has said he will introduce a resolution to protect further security-clearance revocations, the likelihood of that strategy succeeding is roughly nil. And the unsurprising lack of GOP pushback likely means that President Trump will have even less compunction than he would have otherwise about yanking more security clearances from his enemies’ list. For his part, Brennan said on Meet the Press that he’s strongly considering legal action against the president in response to Trump’s bullying.